Portable speed bumps are great for slowing down and calming traffic in areas that are near outdoor events, public schools, bustling fairs and other locations where cars and people are intermingling (Source). These brightly colored portable traffic control options are a real lifesaver in the event that you need to keep drivers from behaving aggressively or driving too quickly nearby pedestrians (Source). The 117" long polyurethane Discount Ramps portable speedbump is our top pick- with users saying that it is a functional speedbump that easily folds up and can be effortlessly transported around to different street locations, folding to 13.5" x 10" x 12.25". On the downside, it doesn't provide much of a bump for cars, it's more of an eye signal to vehicle drivers that they need to slow down in the area. Since this portable speed bump doesn't screw into the ground, like the Electriduct option does into concrete and asphalt, the speedbump may move around a bit as it's in use. It does come with a transport bag so that you can move it around to different locations pretty conveniently. It also includes a one year Manufacturer's Warranty, it will not cover normal wear and tear associated with its use. Great for promoting pedestrian safety in a pinch- let's take a look at five of the best-selling portable speed bumps in the market today and see how they compare. The 24 lb,117.6” x 9.8” x 1” Portable Folding Traffic Control Calming Speed Bump is a reasonable option that folds accordion-style to a compact size of 13.5″ x 10″ x 12.25″. Its users like that it slows down vehicles without being too annoying, but also note that its light weight causes it to be pushed around. It can be carried easily by its ends that have built-in handles. The segments are black and bright yellow and feature reflective directional arrows. The material used is durable polyurethane with a traction surface and can withstand any weather condition. It comes with a handy bag for easier transport and storage. This folding speed hump is a good option if you are looking for a lightweight portable speed bump. 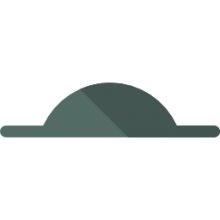 The general consensus on this product is that it functions quite well under light traffic flow, but due to its light weight it gets pushed around and needs to be moved back to its intended place more often than some users are comfortable with. One user says that the reflective tape also immediately begins to peel off too soon. He also thought that the zippered storage bag also gets damaged too easily. The 15 lb, 3’ x 10.5” x 2” Ultra Light Weight Economy Speed Bump is a very effective option that includes concrete floor mounting hardware. Its users love that it is made of high-quality composite material, but also note that you need to purchase 2 pieces of the product to make up a standard sized 6’ speed bump. It is flexible enough to allow contouring to road crown. In addition to the mounting hardware, it also includes one 5” snap-on end cap with a sloped modular profile. Underneath the unit are two 1” channels that allow cables to run through. It comes in black with reflective yellow markings. If bought as a pair, a U-channel connector clip is provided. 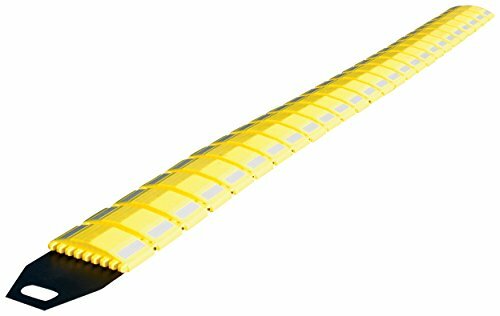 This ultra lightweight speed hump is a solid option if you are looking for a portable speed bump with a permanent/semi-permanent installation option. Users of this speed bump are generally satisfied with its high quality. They are pleased that it is easy to install on a concrete surface and works well even under heavier vehicles such as trucks. One user says that they have been using it for a few years and it is still doing its job well. Another one says that after one year of usage with normal traffic of cars and trucks, it still didn’t show signs of wear. The 46 lb, 10’ x 8.6” x 1.5” Aervoe Portable Speed Bump is a good option that is made of segments linked together by connecting pins and can be rolled up for carrying and storage. Its users like that it is made of durable material, but also note that it is more expensive than other products with similar functionality. Made of impact-resistant yellow polypropylene plastic, this product won’t fade or crack in hot or cold temperatures. It has reflective strips on the front and back of each link. It can withstand a vehicle crush weight of up to 20,000 lbs. Non-skid rubber is attached at the bottom. It can be extended beyond its 10’ length by adding multiple speed bumps together using the hinge pin included. Unit comes with a heavy-duty nylon bag. This rollable speed bump is a nice option if you are looking for a portable hump that is easy to deploy and store away. Users agree that this product works quite well under typical traffic conditions. They like that the material feels durable enough for rugged use and the rubber padding under it prevents slipping. However the handle attached to one end feels like it is made of flimsy material, and the reflective strips may not last long. The 17 lb, 48” x 10” x 2” Vestil SB-48 Speed Bump is a lightweight option that is made of durable recycled plastic. Its users like that the material can resist damage from oil, salt, sunlight, and chemicals, but also note that it may be best used only for slow traffic. It comes with concrete installation hardware (bolts, anchor sleeves, and washers, 3 each) which fit the 3 pre-drilled mounting holes in the unit. Its safety yellow color gives it high visibility. Two parallel channels (1″ W x 3/4″H) run the length of its underside for housing cables. It is capable of withstanding pressures of 3,200 lbs per square inch. This plastic speed bump is a fair option if you are looking for a lightweight portable hump that can also be bolted down in concrete. This product has received generally positive feedback from its users. Because it is very lightweight, it can be carried and installed by a single person. Users also like that it has the option to be bolted down for greater stability. However, since it comes in a single piece that does not fold or roll, some users think that carrying and stowing it is quite awkward, although that isn’t really a deal-breaker. One user also says that it is actually less than the 48” length described. Another user feels that it is not for heavy duty or long-term use. The 55 lb, 72” x 12” x 2” Modular Speed Bump is a very good option that is made of heavy duty rubber with a textured surface. Its users love that it is flexible and constructed of durable material but also note that it is quite heavy. 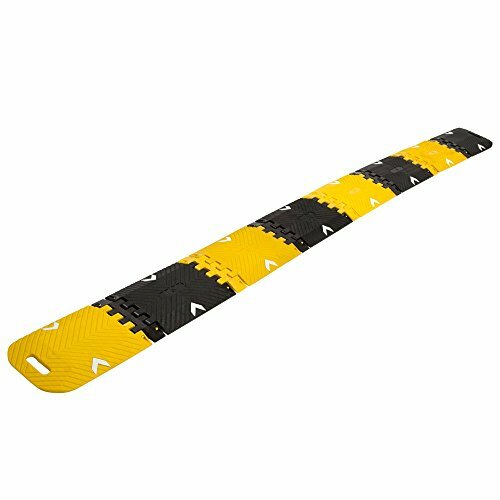 It has high visibility due to its safety strips and 8 embedded reflective beads. Underneath runs 2 parallel 1.38″ x 0.88″ channels for drainage and cable protection. 4 mounting holes are pre-drilled. Its modular design allows multiple speed bumps to be connected together. This modular speed bump is a great option if you are looking for a rubberized speed bump. Users of this traffic calming device are generally satisfied with its performance. They love that it is very effective at slowing down traffic, and that it is tough enough to withstand large trucks. And because it is made of rubber, a number of people are using it not only as a speed bump, but also to divert rainwater. One user noted that it is most effective when mounted on concrete or asphalt, and suggests that users buy installation hardware, which does not come with the product. Another user likes that end caps can also be bought separately if desired. Speed bumps, often the bane of drivers, are highly valuable safety devices to force car and truck drivers to decelerate around pedestrian-heavy areas. They are frequently employed in places like crosswalks, parking lots, outdoor festivals, nearby concert venues and any other area where pedestrians and cars happen to be sharing the same space. As we have noted in our reviews, sometimes it isn't the size of the speedbump, but just the drivers' instinctual reaction to the black and yellow coloration of these speed bumps that cause them to instinctively decelerate their vehicles. 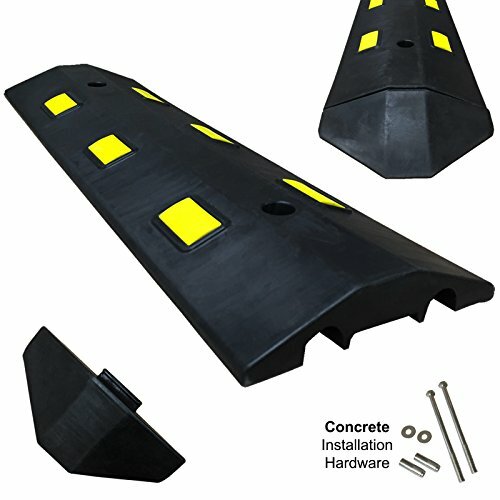 Some of the options are more lightweight than others- with the Electriduct providing a more secure option that can ship with mounting hardware to help you permanently install the speed bump on asphalt and concrete surfaces. It is designed to withstand harsh elements like snow and salt, as well it can be combined together to form longer units, should you need to install them across especially wide lengths of road. At the end of the day, speed humps are primarily designed to help improve the safety of pedestrian traffic, reinforce stop signals inside of parking lots, and help to reduce accident risk wherever drivers and pedestrians happen to be interacting in public. You don't want the speedbump to be too high, because otherwise it may damage a car, and as we have observed from reviewer feedback, most drivers primarily react to the visual cue of the yellow and black coloration, which makes them slow their car in anticipation of encountering a pedestrian crosswalk. Additionally, in some cases it's important that emergency vehicles not need to slow down when encountering the speedbump- so if the speedbump is too tall, and can potentially damage these first responder vehicles, that would not be a good situation either. Many of the speed bumps supplement the yellow and black colors with reflective surfaces that make them highly visible from great distances and particularly illuminate under the gaze of vehicular headlamps. If you are in the market for a portable speed bump, figure out whether you want one that can be mounted into the ground, and therefore semi-permanently installed, or one that can just be lain down across the roadway during an event, and then picked up and brought back to your home or business when the event is done. That is an important consideration if you are considering purchasing one of these roadway safety devices- and is one that you should consider if you are interested in keeping pedestrians and car drivers safe.